How much is the Non-Concessional Contributions Cap? Note that some people may be eligible to use the three-year bring forward rule. What determines the Non-Concessional Contributions Cap? This change was made to keep the Non-Concessional Contribution cap at the same level when the Concessional Cap was halved, rather than an increase in the Non-Concessional cap. 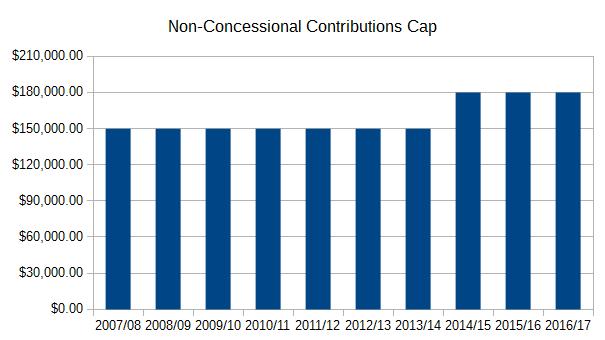 How much has the Non-Concessional Contributions cap changed? How much was the Non-Concessional Contribution Cap in prior years? What is the three-year bring forward rule? The three-year bring forward rule allows some super fund members to use more than one years non-concessional cap in a single year. For example if the members non-concessional cap was $ 180,000 they could contribute up to $ 540,000 in a three-financial year period without exceeding the contribution cap. See three-year bring-forward rule for super contributions. You may also find the article Did freezing indexation of the contribution caps change anything? interesting. Also see How much is the Concessional Contributions Cap?